This is a closed Beta: in order to provide the best support possible to our beta-testers, the number of participants is limited. If your game is tight on memory and could use high-quality sounds that take only a few hundred bytes, if you want total control over your sound effects from the game parameters, if you want automatic sound variations, or if you simply want to experience an awesome new way to design sounds, join the program! We are looking forward to discovering what you will do with GameSynth and how your game will redefine sound interactivity thanks to procedural audio! Of course, we will help you every step of the way. 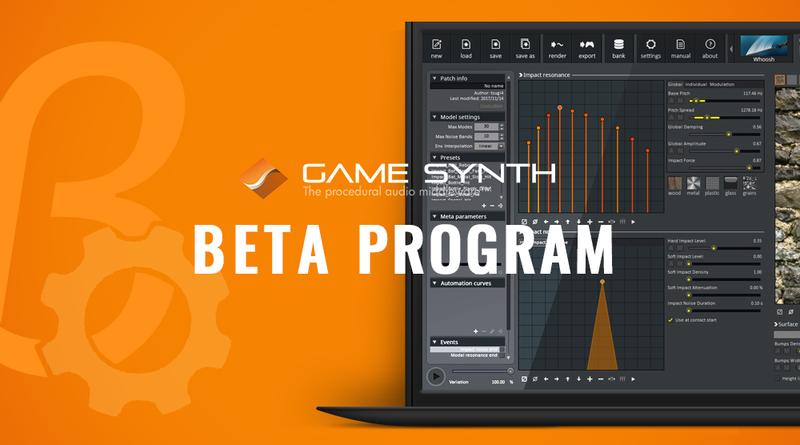 For more information about what you can do with GameSynth, check our playlist on YouTube, with videos that describe the various models available in this Beta and explore dozens of sound patches. 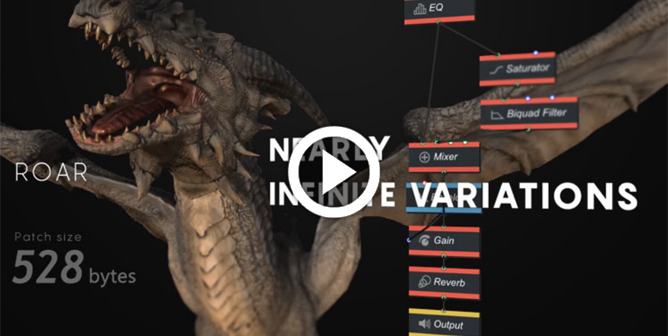 You can also see a complete dragon model implementation below, including roar, fire, wings, tail and footsteps sound effects, all in less than 6 kB! Are you already in full production? No worries; if you cannot wait for GameSynth to be released, don’t hesitate to contact us: we can develop a specific procedural audio model for you!